A man from Spring Hill, Florida, pulled into a drive-thru on Wednesday, Jan. 17, then fell asleep before ordering. He woke up to a man pounding on his window, and asked if he could order a burrito. The manager, Martin Claussen, said no—he was at a Bank of America, not a Taco Bell. Google Maps shows a Taco Bell about a half mile down the road. Claussen alleges the driver, Douglas Francisco, 28, then drove off, but parked in the bank’s parking lot. When a sheriff’s deputy arrived to investigate, he found a blue Hyundai sedan in the bank’s parking lot with the motor still running. Francisco was in the driver’s seat and appeared to be on narcotics, the deputy alleged. Claussen identified Francisco as the man he had encountered in the drive-thru, and said he had to pound on the car window “for some time” to get him to wake up. According to the Hernando County Sheriff’s Office, Francisco “made several statements that were differing from reality such as having his air conditioning running in the car when the heat was on while the temperature outside was in the mid-40s,” reports the Hernando Sun. Francisco failed a field sobriety test and was arrested on charges of driving under the influence. Xanax and Oxycodone were found on him at the time of his arrest, both of which he was prescribed. 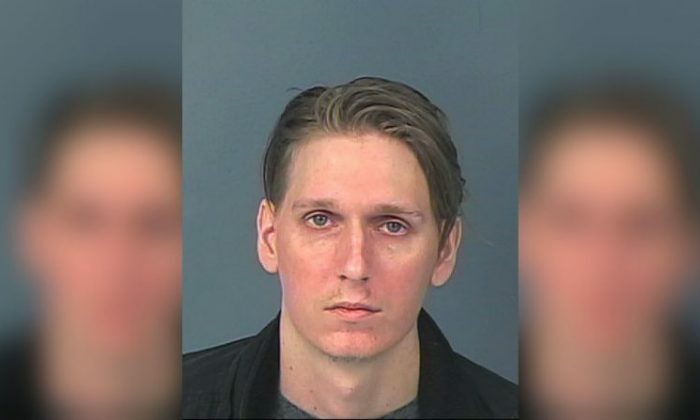 He was booked into the Hernando County jail and freed Thursday, Jan. 18, after posting $500 bail, the Tampa Bay Times reports.